Determine your current position with GNSS 5 click. It carries the NEO-M8N GNSS receiver module from u-blox. 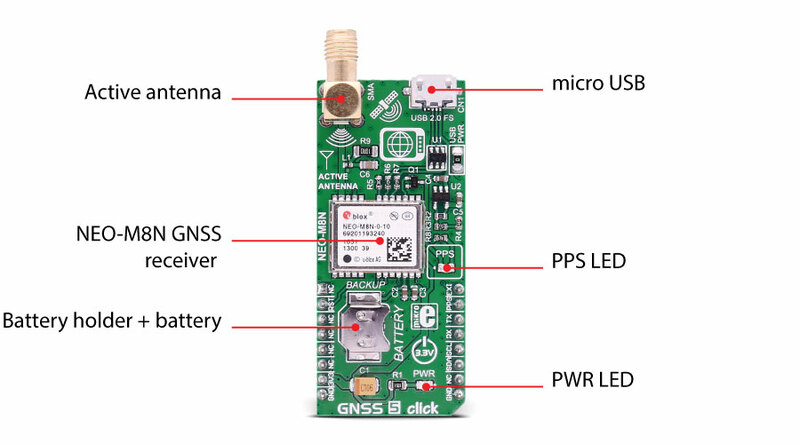 GNSS 5 click is designed to run on a 3.3V power supply. The click communicates with the target microcontroller over I2C or UART interface, with additional functionality provided by the following pins on the mikroBUS™ line: RST, INT, PWM. A USB interface (micro USB port), which is compatible with the USB version 2.0 FS (Full Speed, 12 Mbit/s), can be used for communication as an alternative to the UART. The USB port can be used as a power supply as well if you need the click board™ to be a standalone device. The NEO-M8 series of concurrent GNSS modules are built on the high performing u-blox M8 GNSS engine in the industry proven NEO form factor. The NEO-M8 series utilizes concurrent reception of up to three GNSS systems (GPS/Galileo together with BeiDou or GLONASS), recognizes multiple constellations simultaneously and provides outstanding positioning accuracy in scenarios where urban canyon or weak signals are involved. The u-blox NEO-M8 modules can also benefit from the u-blox AssistNow assistance service. The Online service provides GNNS broadcast parameters, e.g. ephemeris, almanac plus time or rough position to reduce the receiver’s time to first fix significantly and improve acquisition sensitivity. Hardware Backup Mode - If the main supply voltage fails, and a battery is connected to V_BCKP, parts of the receiver switch off, but the RTC still runs providing a timing reference for the receiver. This operating mode enables all relevant data to be saved in the backup RAM to allow a hot or warm start later. GNSS stands for Global Navigation Satellite System, an umbrella term that describes both the United States GPS, the Russian GLONASS global positioning systems, and European Galileo. A constellation of satellites sends a continuous signal towards Earth. Onboard every satellite is an atomic clock, and all of them are synchronized, thanks to a reference time scale defined by the whole system. So, that the signals coming from the different satellites of the same constellation share the same reference time scale. 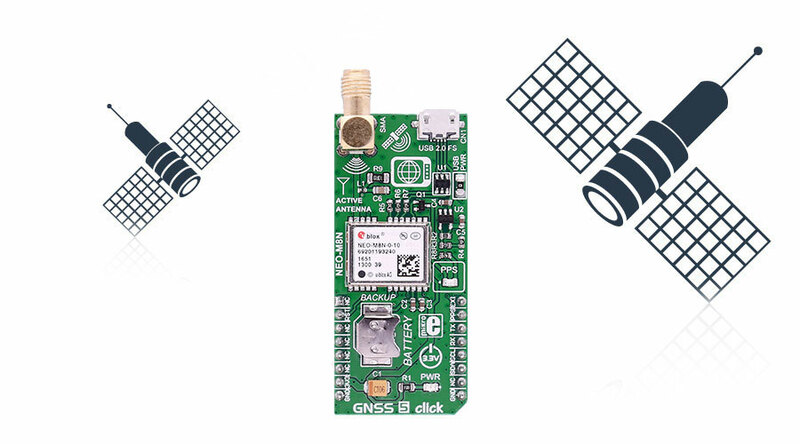 If the user wants to utilize GNSS to determine a position, they must have an antenna that receives the signals coming from the satellites, and a receiver that translates these signals. The antenna position will be deduced from the measurements of the time delay between the emission time (satellite) and the reception time (receiver) for at least 4 signals coming from different satellites. Applications Asset tracking, for navigation devices based on GPS and GLONASS, road navigation devices, public transport, wearable devices, etc.